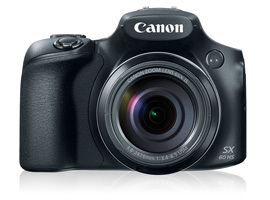 As a bridge-type (DSLR-style) model, the PowerShot SX60 HS offers a relatively small size 1/2/3”-type (6.17x 4.55mm) 16-Mpix CMOS sensor combined with a 65x optical zoom offering a 3.8-247mm f/3.4-6.5 range of focal lengths with the equivalent field of view of a 21mm ultra-wide to a 1,365mm super-telephoto. It features Canon’s most up-to-date DIGIC 6 processor offering RAW image capture with an ISO range up to 3200 at native resolution (ISO6400 at reduced resolution), continuous bursts at up to 6.4 fps, and Full HD 1080/60p video. In addition, the SX60 HS has a fully-articulated three-inch (922k-dot) LCD with side hinge, and features a substantial handgrip and as well as a shooting mode dial, with nearly everything else accessed via buttons and a four-way rocker switch located at the rear, rather than control dials. A tiny pop-up flash occupies the space immediately in front of the built-in 922k-dot EVF, and like most contemporary models, it features built-in Wi-Fi with NFC. Comparable in size and weight to a small DSLR with kit lens, the SX60 HS measures 5.0 x 3.6 x 4.5” / 12.7 x 9.1 x 11.4 cm and weighs 22.9 oz / 649g. It is available now at around $550. 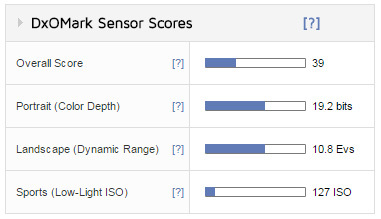 With an overall DxOMark sensor score of 39 points, the SX60 SH has good image quality for this type and size of sensor. Although a little lower than that of recent rival models using a similar sensor, color sensitivity at 19.2 bits is still good and dynamic range at base ISO is a respectable +10.8 EV. Viewed against larger sensors, the low-light ISO score of 127 ISO may look low, but it’s comparable with rival models using similar sensors. 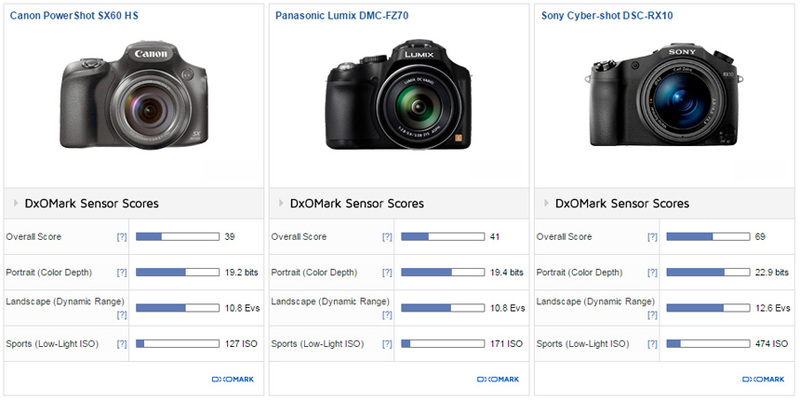 For comparison, the SX60 SH ranks alongside the $399 Panasonic Lumix DMC-FZ70 at 41 points. 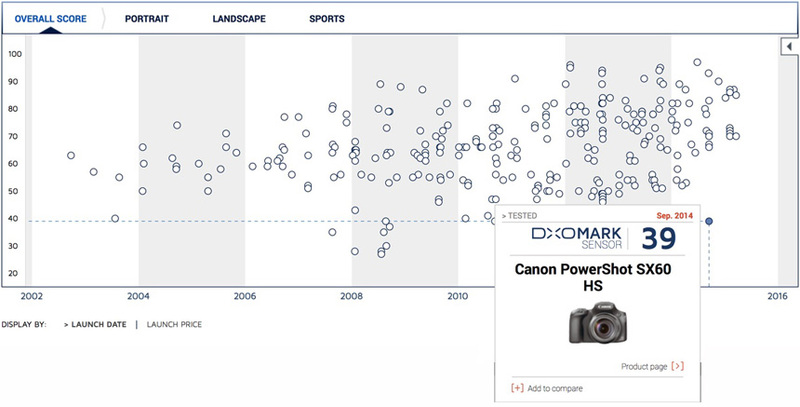 Against the most recent rival camera in our database using a similar 1/2.3”-type sensor and 60x optical zoom with a 20-1200mm equivalent and f/2.8-5.9 variable maximum aperture, the Panasonic Lumix DMC-FZ70 achieves a near identical score overall. It has slightly lower noise, accounting for the marginally-higher color depth and low-light ISO scores. As an academic exercise we also compared the Sony Cyber-shot DSC RX10. At around $1,300, this camera can’t compete on price and as such it targets a slightly different audience. Not only does it offer a physically larger (by surface area) 1”-type 20.2-Mpix BSI CMOS sensor with a 24-200mm equivalent zoom and constant f/2.8 maximum aperture, the faster equivalent maximum aperture dramatically improves the sensor scores. Noise levels are significantly lower at base ISO, and along with that comes improvements in color discrimination, dynamic range and, of course, lower noise at higher ISOs. While it’s true that we don’t have a wide range of similar models that output RAW files in our database with which to make comparisons, the sensor in the Canon PowerShot SX60 HS has no real shortcomings other than perhaps the inherently low noise levels of 1/2.3”-type sensors. The sensor is capable of delivering good image quality overall, and while compromises are inevitable in cameras, especially models like this, the SX60 HS has an attractive feature-set, including the wide-zoom range, articulated LCD, and some advanced video features.